Why is YouTube not working on my iPhone mobile anymore? I've tried everything but nothing works. Now videos are not playing on iPhone and keeps loading. This is too bad and I need a solution. I got my iPhone 7 Plus and I noticed that YouTube won't work on iPhone. For the past week or so I realized I can't do that anymore and I keep getting a message saying "sorry, this video is not available on this device." How to fix this playback error on iPhone? I have installed the YouTube app, but why wont YouTube work on my iPhone with a HD movie trailer? I know the video is offered in 1080P even 2 and 4K. I can see no contents on the app in the iPhone now. Plus, all the apps are not working, Kids app, YouTube Red... Help. iPhone won't play YouTube videos, really frustrating! Almost all the iOS (iOS 12/11/10/9/8/7...) mobile users who use their phone to view videos have experience YouTube not working on iPhone problem, like slow loading, endless buffering, poor quality or straightforward message to ask you to tap and retry... The factors lead to iPhone YouTube not working include internet problem or 3G/4G cellular data difference, software/hardware issues to play videos etc. It can be a hard process to find the reason for why YTB won't work on iPhone mobiles. Below are all the tips for iPhone 8/7/6s/6/SE no response for YouTube playback, try if there is one that works for you. YouTube is reported with access issue of YouTube app both on desktop and mobiles on Oct 26, 2018. It's a matter of 503 error. You cannot open YouTube app on your iPhone. Besides this issue, iPhone users, who've updated to the latest iOS 12 version are experiencing an aggressive battery drain when running YouTube app. A way to tackle the Youtube not working on iPhone problem is to remove the standalone app or at least close it and download videos from YouTube beforehand and then watch the contents without opening YouTube again. Besides, users are also running into troubles such as YouTube not playing on mobile devices, being unable to log into YouTube website, stream videos or open the app on mobiles, loading extremely slow and then shows nothing... If you are also having watching problems on iPhone (iPad or other mobiles), unfortunately there is no official fix for this yet. But the tips below may help you out. 1. Internet settings. Try to switch your connectivity to another network. This is simple but it works in many cases of YouTube wont work on iPhone. If you're on your cellular date, try to down from 4G to 3G, or turn off and retry the internet. If you're on WiFi, check if there is any problem with your router. Or change the frequency of WiFi from 5GHz band to 2.4 GHz band only. 2. Update your modem firmware. Users who is having YouTube not working on iPhone mobiles, even through the app, can try to check if their Modem firmware is in the latest version. Otherwise, update your Modem firmware first. The latest firmware will also help to get a faster bandwidth connection. 3. Uninstall iOS YouTube app. To install an app is a good way to avoid playback errors on iPhone. But since uers are also complain that the app not working on iPhone mobile problem, they may first force to close the YouTube app or restart your iPhone to see if the videos not playing on iPhone problem is solved. If not, uninstall the app > reboot iPhone > reinstall YouTube app on iPhone from the App Store. 4. Free download YouTube videos to iPhone. Many YouTube videos aren't enabled for mobile devices including iPhone for format, resolution issues. 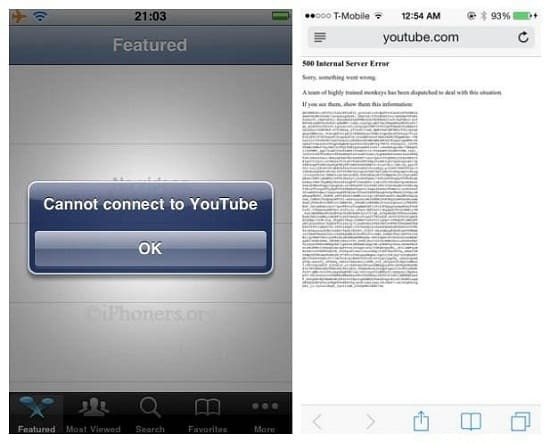 If your iPhone has trouble playing YouTube videos of any kind, you may free download it for smooth playback. MacX Video Converter Pro is a good choice for this job. It can free download videos movies of 4K UHD 2160p, 3D Blu-ray, HD 1080p/720p SD resolution and in formats of MP4, FLV, MKV, 3GP, AVI etc with original quality to your iOS 10/9/8/7/6 iPhone 7/6S/SE/6/6 Plus/5s/5c/4, iPad Android phones and tablets. 5. Adjust the video quality. Some users cry that YouTube not working on iPhone with videos in HD quality. If you have a YouTube app installed on your device, it will automatically adjust of the video stream based on your phone and the internet connection speed. If it is not, you may manually lower the video quality to a lower clarity resolution to help resolve YouTube won't work on iPhone issue. 6. Retry playback or restart the video. Many users have ever been reminded the message "tap to retry playback or restart the video". When YouTube videos are not playing on iPhone and you see the message to ask to tap and retry, touch the player one or more times to let it refresh. If the playback error on iPhone still exists, follow the steps: Swipe down to minimize the video > Swipe to the right to dismiss the video " Find and select the video again. 7. Restore your iPhone. Still have no idea of why YouTube wont work on your iPhone? OK, restore your iPhone is the left way to go. Connect your iPhone to your computer and open iTunes. Click on the iPhone's name in the "Devices" panel and click "Restore". Then just follow the prompts that pop up and go to restore your iPhone. See if it fixes YouTube errors with iPhone. Good luck! Tired of troubleshooting why won't YouTube work on my iPhone, to free download videos from YouTube seems to be a more straightforward solution to YouTube not working on iPhone error. Let's check how to download YouTube videos to iPhone for free below. First, free download MacX Video Converter for Mac (or MacX Video Converter for Windows version) on your computer. Note that both macOS Mojave and Windows 10 are supported. 1. Click "YouTube" icon on the main interface and paste the URL of the YouTube videos that you want to watch on iPhone/iPad/Android to the Box and click "analyze". Alternatively, you can click "paste & analyze" button to automatically detect the music details. 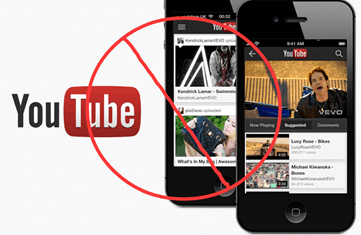 Note: Besides the ability to fix YouTube wont work on iPhone issue, it helps to free download video movie music free from Vevo, Vimeo, Dailymotion, Facebook, Metacafe and other 300 more sites. 2. Choose output format of the downloaded files. You may choose a iPhone compatible video audio format like MP4 MP3, or directly choose your iPhone device (iPhone X/8/7/7 Plus/se/6s/6/6 Plus/5S/5C/4, Android Samsung, HTC etc) from the list. 3. Hit "Download Now" to start to free download YouTube videos. Any UHD HD videos can be download with 98% original quality within only minutes. 4. Transfer the downloaded YouTube videos to your iPhone devices through iTunes or USB. Then you can watch the video without iPhone YouTube playback error. Note: In addition to iPhone YouTube not playing problem, there are many users suffer from YouTube errors with Apple TV and iPad. For those users, the above troubleshooting tips and downloader are also worth a try to help to fix the problem. And owing to the fact that YouTube gets down from time to time, you're suggested to download YouTube videos offline if the video is very significant.